Charles Hamilton Houston was an American lawyer and educator instrumental in laying the legal groundwork that led to U.S. Supreme Court rulings outlawing racial segregation in public schools. Houston graduated as one of six valedictorians from Amherst (Mass.) College (B.A., 1915). After teaching for two years at Howard University in Washington, D.C., he enlisted in the U.S. Army and was commissioned first lieutenant in infantry in a segregated training unit. He was later recommissioned a second lieutenant in field artillery and served in France and Germany during World War I. Following his discharge in 1919, Houston enrolled at Harvard Law School (LL.B., 1922; D.J.S., 1923), where he was the first black editor of the Harvard Law Review. He went on to study civil law at the University of Madrid. After being admitted to the bar in 1924, he practiced law with his father until 1950. 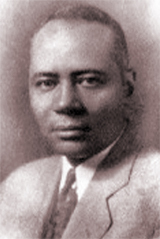 As vice-dean and later Dean of Howard University Law School (1929-35), Houston shaped it into a significant institution, at the time training almost a quarter of the nation’s black law students. During his tenure the school became accredited by the Association of American Law Schools and the American Bar Association. Houston made significant contributions in the battle against racial discrimination. From 1935 to 1940, he served as special counsel for the National Association for the Advancement of Colored People (NAACP), arguing several important civil rights cases before the U.S. Supreme Court. In State ex rel. Gaines v. Canada (1939), Houston argued that it was unconstitutional for Missouri to exclude blacks from the state’s university law school when, under the “separate but equal” provision, no comparable facility for blacks existed within the state. Houston’s efforts to dismantle the legal theory of “separate but equal” came to fruition after his death in 1950 with the historic Brown v. Board of Education (1954) decision, which prohibited segregation in public schools. Houston’s contributions to the abolishment of legal discrimination went largely unrecognized until after his death. He was posthumously awarded the NAACP’s Spingarn Medal in 1950. Several public schools bear his name, as does the main building of the Howard University School of Law. A law professorship and several student organizations also honor Houston.